Woo-hoo! The warmer weather is here! How lovely was Sunday? (That is, the Sunday after the first warm Sunday of the year). We had our first barbecue of the season! It was originally planned as a quiet Sunday lunch, but developed into a rather epic barbecue luncheon, affectionately titled: PORKTOBERFEST. I arrived at PORKTOBERFEST in a rather circuitous fashion, so let me explain. After I got Nigella's Kitchen, one of the most enticing recipes was the beer-braised pork knuckles with caraway, garlic, apples and potatoes. I know, right? Nigella prefaces the recipe with a 2-page explanation of her love of German food, and the German language! She singles out Bienenstich cake as "confectionary of the gods". Bienenstich, you may remember, is my favourite German cake. Her love of it just proves how much Nigella rocks. Now, pork knuckle isn't the type of thing one should eat alone, (believe me, I've tried! 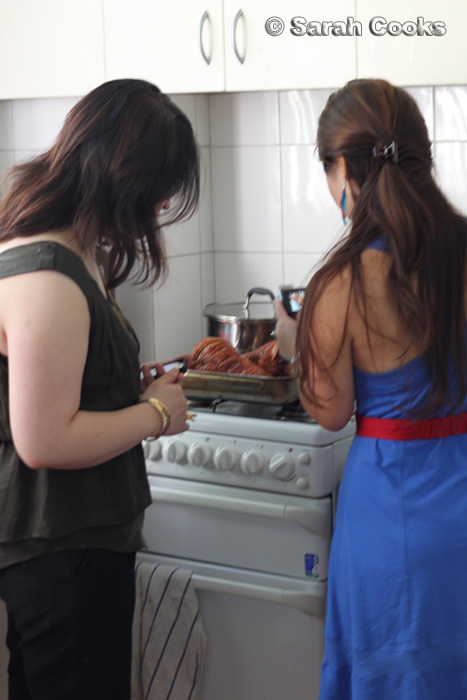 ), so I thought it would be a good dish to make for friends, and the "pork-knuckle lunch" was born. 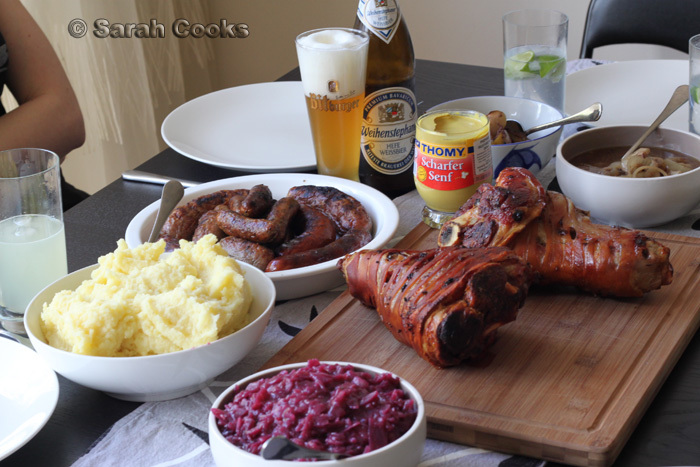 After we'd invited everyone, I also realised that we'd organised our pork-knuckle lunch for the first Sunday in October... which is traditionally the end of Oktoberfest! So the pork-knuckle lunch morphed into Oktoberfest. Last week, encouraged by the lovely warmer weather, we also bought a barbecue! It's a very cute little Weber Smokey Joe Grill, and I love it! It's aimed at young people who've just moved out of home - perfect! The Oktoberfest party seemed to be the perfect opportunity to break out the new BBQ, so on Saturday we drove down to Andrew's in Yarraville and bought a crazy amount of sausages. 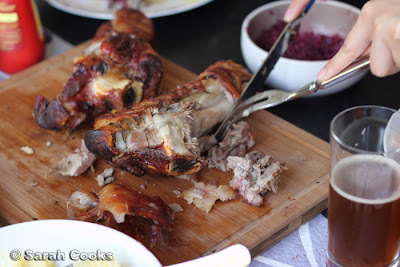 (Free-range Otway pork knuckles were purchased across the street at Yarraville Village Butcher). And thus, Oktoberfest became PORKTOBERFEST. The recipes for the both cheesecake and the knuckles come from Kitchen, of course. 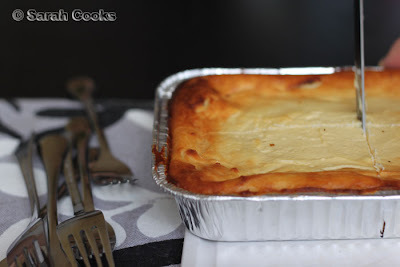 I'll do a separate post about the cheesecake soon, as I feel this post is already getting dangerously long! 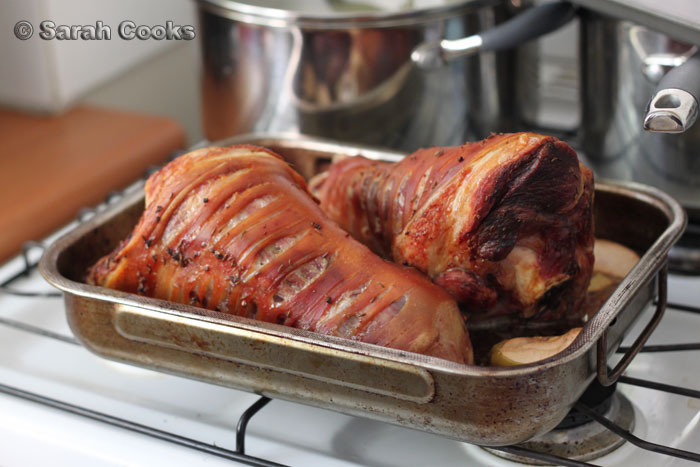 The pork itself wasn't too difficult - you just rub it with garlic, caraway and salt, and chuck it in the oven. (The butcher did the tough job of scoring the rind). It only takes about 3 hours in total, so it wasn't too bad getting up in the late morning to get started. Too easy! I tried standing them up like in the book, but the knuckles didn't have a flat base so they just fell over, and I roasted them on their sides. In the tin along with the hocks are apple slices, onions and beer. Nigella suggests adding potatoes, but I wanted mash so I skipped them. And now, looking back at the photos, I realise that potatoes wouldn't have fit in the tin anyway. 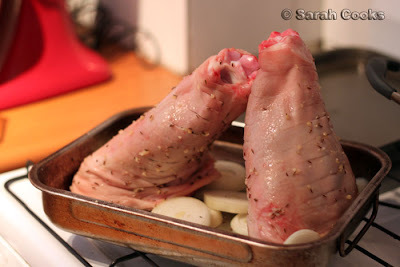 Midway through roasting, time to baste the hocks again! 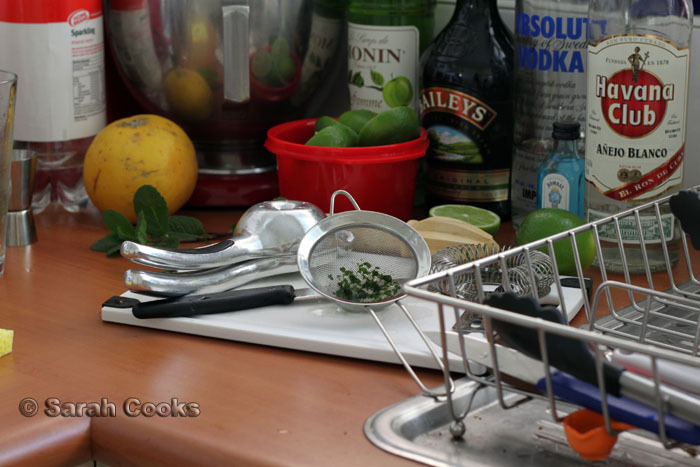 While the pork was cooking, there was heaps of time to clean up the house, make the mash and red cabbage, and prepare the drinks. 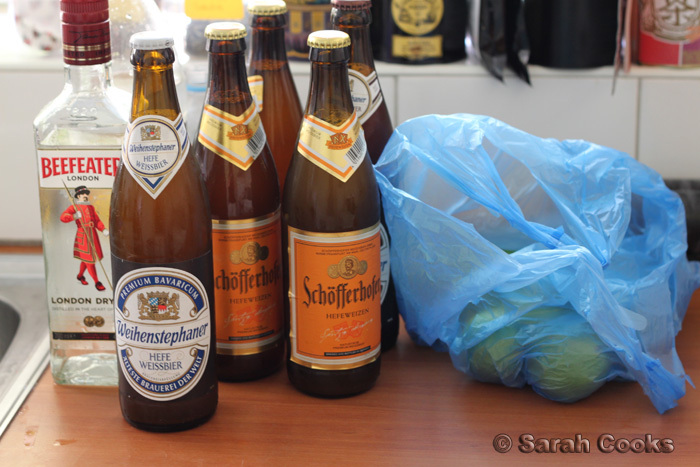 BIER (and Gin)... and limes! Mojito station! Not exactly German, but a perfect BBQ drink nonetheless. Sandra was in charge of the BBQ, which was a good thing as I shouldn't be allowed anywhere near open fires! We had cheese kranskys, Bratwurst and cumberland chipolatas. 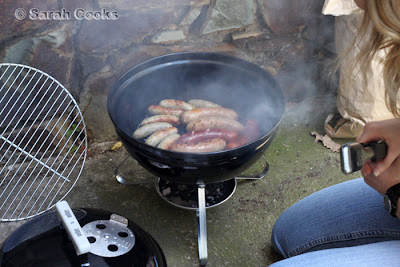 Barbecueing sausages on Weber Smokey Joe Grill. How cute is the BBQ!! Pretty. I've never cooked pork knuckle before, and I was quite pleased with how it turned out. The only issue was that unlike pork shoulder or leg, I was unable to pull off the rind and put it back in the oven for proper crispening. This meant that there wasn't a lot of nice crackling for us, although it was probably for the best. Carving - Wusthof Carving Knife & Fork RULE! Below we have the roasted apples (like applesauce but easier), and the fabulicious oniony pan juices. You know, I was expecting leftovers - there were 6 of us, and the knuckle alone was meant to be enough for 6 people - but somehow, sitting around and laughing and talking, we somehow ate ALL the meat and ALL the sausages. Oops. What can I say? My friends must really love sausages. Heh. After a bit of a rest, some more drinks, a lot of laughs and doing the dishes, we hunkered down for dessert. 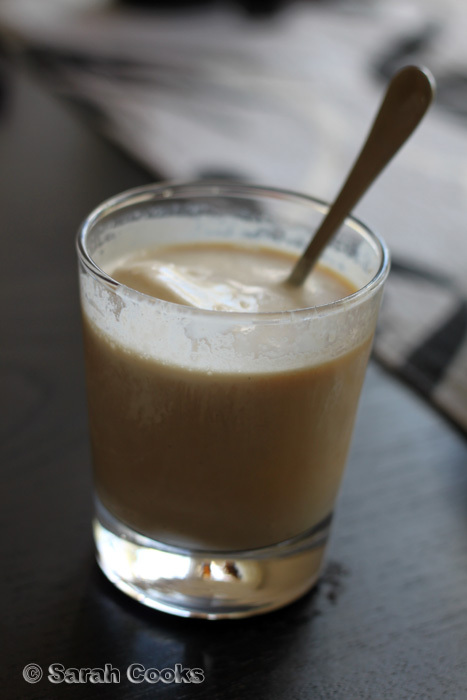 First up - iced coffee! 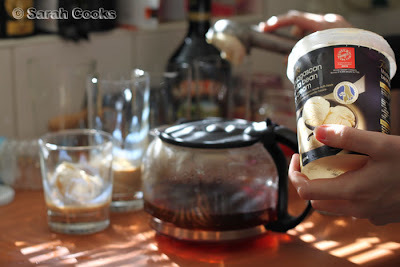 We brewed a big pot of coffee in the morning and let it cool down. To the cold coffee we added Baileys, milk and vanilla ice-cream, for some cold-and-creamy refreshment. All in all it was a fabulous, fabulous afternoon! Big thanks to my friends Alae, Sophia, Tim and SuSu for wonderful company and supplying the German beer! Shall we make PORKTOBERFEST a yearly tradition? Annual porktoberfest? Bring it on! OMG I want to be invited. Next Oktoberfest you should consider hiring a live German Band or Polka Band to take it to the next level. That BBQ is cute and very handy! Hope we get a lot of nice weather days so you can use it! 1) PORKTOBERFEST. I'm a sucker for wordplay. 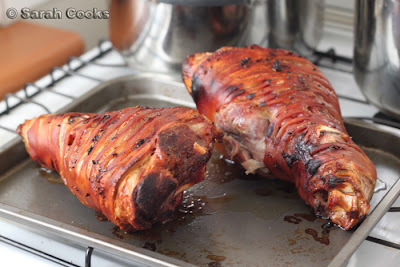 2) The fact that the pork knuckles inthe first photo looks like spaceships from Battlestar Galactica or Firefly. 3) Cheesecake. Always and forever. Oh! GREAT! Please invite me next time? mmm, wish i was there, love a pork feast anytime! Can you make this in our pot luck? Um...soon! @Catty - Oh, I know of Lowenbrau! Read about it heaps on Grab Your Fork and Chocolate Suze. Their knuckle had more crackling than mine, jealous. @Drew - Awesome! I want to buy a dirndl too but I've been forbidden, hahaha. @April - Did you know in Munich for Oktoberfest they have HEAPS of food as well as the beer? 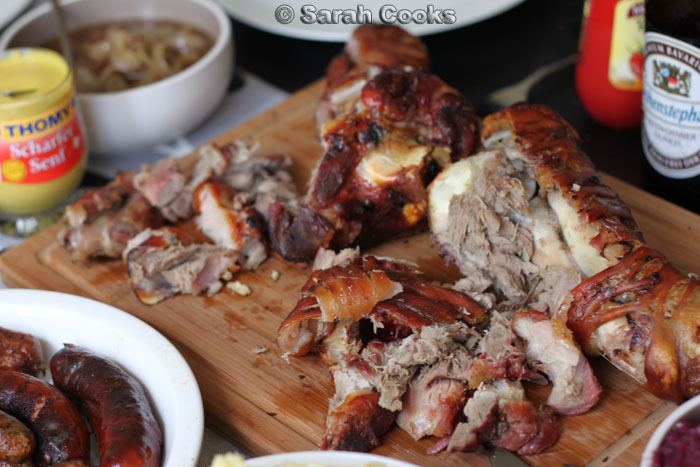 Like chickens on spits, pork knuckle, sausages (of course) and more! @Hannah - Yay, you picked up that PORKTOBERFEST has to be in capitals! Hehe, I never picked up that the knuckles look like spaceships. Extra awesome! @Ange - I agree with you 100%! Nicola - Good for you! Glad you enjoyed the recipe! information well and good ... I like your way of thinking. 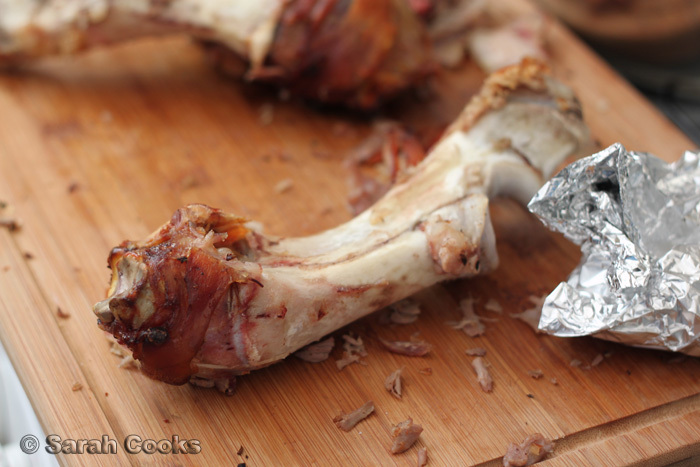 That bone and some beans would make good soup!